India's longest bridge has been designed to accommodate the movement of tanks. Guwahati: India's longest bridge, over nine kilometres long, is likely to be inaugurated a year from now in Assam by Prime Minister Narendra Modi. An invite was presented to him this week by Chief Minister Sarbananda Sonowal. The BJP won Assam from the Congress last year, becoming the first of the eight northeastern states to be controlled by the party. 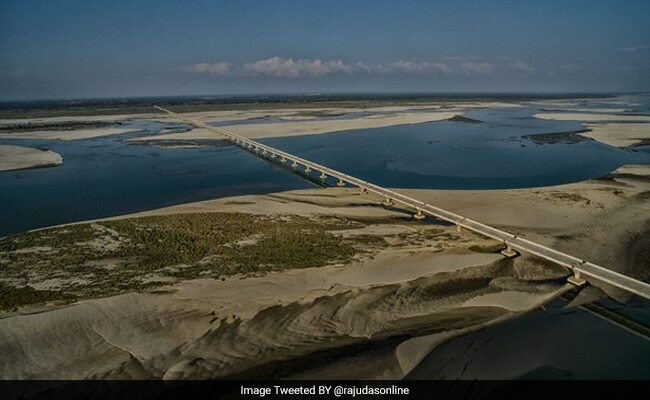 In Assam, the bridge is located in Sadia, 540 kilometres from the state capital of Guwahati. Its other end is in Dhola, 300 kilometres from Itanagar, the capital of Arunachal. It is a little over nine kilometres long - that's nearly 30 per cent longer that the famous Bandra-Worli Sealink in Mumbai. Construction began in 2011, when the Congress governed Assam. The cost of the project is about 950 crores. So far, there is little road connectivity between Assam and Arunachal. Currently, the only route for people looking to travel from this part of Assam to Arunachal is by boat. Its strategic importance for the military is huge. With the bridge, troops will be able to enter Arunachal Pradesh, which borders China, much more quickly and easily. The bridge has been designed to accommodate the movement of tanks. Construction of this bridge was included in 15,000 crore package sanctioned by the centre in 2015 to improve road connectivity in the border state.